This hands-on activity is great to use for small group, for math centers, stations or whole group instruction. This is for lessons on solving inverse of a 2 x 2 and 3 x 3 matrices. There are 12 questions, There are six 2 x 2 matrices and six 3 x 3 matrices. This product has three options. 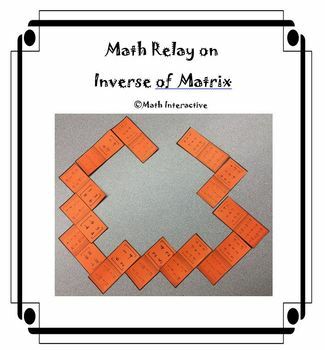 Option 1 is a math relay. The students will create maze by matching matrices and their inverse. Each card has shaded squares which have the answers and unshaded squares which have the questions. Students can start with any card. He or she will solve the question attached to it. She then finds the card that has that answer and connect it to his/her card. Repeat the process until there is no more card left. The answer to the last card is on the first card. Your students will enjoy putting together the puzzle as they solve math problems. In a group, students work together to match their problems and answers and solve the puzzle. If they solve the problem correctly, they find the answer piece and continue working, but if they don’t, they must recheck their work and correct the mistake before they can move on. Also, the puzzle pieces are jumbled so you can have students cut them out without seeing the answers. Option 2 is matching cards. 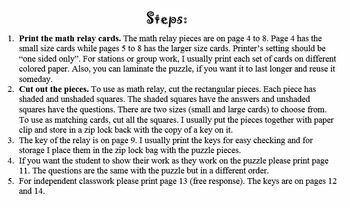 If you cut the squares on the relay cards, the students can match the matrices and their solutions. Option 3 is independent classwork. This product also includes worksheet for solving inverse of matrices. 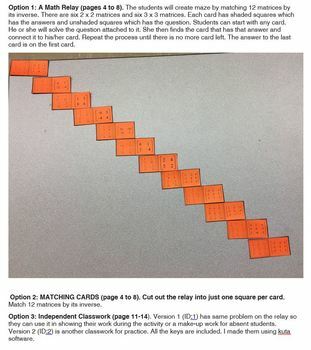 Version 1 (ID:1) has the same questions with the puzzle but in different order, so they can use it in showing their work during the activity or a make-up work for absent students. Version 2 (ID:2) is another classwork for independent work/practice. All the keys are included.